Because no holiday is the same. We craft our safaris to your budget and expectations in combination with our Africa knowledge and in-depth expertise. African safari camps & lodges offer special rates and deals to their preferred partners like Chalo Africa – allowing us to share those savings with you. We are always by your side (on phone, email and Whatsapp) to ensure a seamless holiday experience — before, during and after your journey. We partner only with the finest companies that share our vision and conservation principles, giving you an authentic safari experience. Why Go On An African Safari Trip? A short question that has a hundred answers and no answer. When we started Chalo Africa in 2012, a lot of our friends would ask us why we were focusing exclusively on Africa? Why weren’t we expanding to other destinations and continents? The truth is that Africa found us a long time before we found Africa. For Smita, it was while pouring over intricate zoology diagrams while doing her Masters. For Sangeeta, it was as a teenager, crossing the bustling streets of Calcutta into the building of Alliance Française, which eventually led to her francophone journey to Algeria. For Tanvi, it was watching a ladybird flit across the palm of her hand when she was thirteen, capturing it for posterity with a digital camera and a macro lens. The moment you reach the wilderness of Africa’s national parks, your heart beats slower, your stress levels fall. Here the air is clearer; the sky is brighter; the world is as it should be. You forget the humdrum of daily life, you, in fact, forget yourself. Nature, in its unimaginable entirety, greets you with warmth and folds you into the depth of its arm. You return to your origin. And the beauty of Africa is that it forces you to look inwards. Whether you are gazing at star-studded skies or waiting with bated breath for a hyena pup to emerge from its den, your mind wanders and you find answers to all that you are seeking and not seeking. You make unlikely friends with a pied wagtail who joins you for lunch every day and see a younger version of yourself in the stories shared by your guide. Africa is about discovery. New lands. New stories. A new you. The only journey, after all, is the one within. Africa is often a dream destination for many travellers. A continent like no other, offering vistas and wildlife like no other. From the open plains of the Serengeti to the rising waters of the Okavango Delta to the impenetrable forests of the Virunga Massif, Africa’s diversity is mind-blowing. Planning an African safari tour can be a confusing ordeal, even for repeat travellers. That is why it is best to let our experts guide you. For no extra charge, our Chalo Africa Safari Gurus can help you decide the best time to visit Africa, the best African safari camps to stay in, and the best experiences to choose from. Why is an African safari trip so complicated? Well, mostly due to the number of unpredictable variables involved. Wildlife is unpredictable as is the weather. You need to know where to go – when to go – where to stay. The logistics in organising your safari vehicle and guide can be complicated as can arranging transport between remote parks. While you can try planning your safari online, it usually becomes a confusing and messy affair. That is why it is best to get in touch with an African safari consultant or planner (like Chalo Africa) to help you plan your trip. For example, if you want to catch the Great Migration in Tanzania in July, there is no point staying in Southern Serengeti. If you want to be amazed by the bat migration in Zambia, there is no point going in August. If you want to be overawed by the mighty Victoria Falls, don’t travel in October when the flow of the Zambezi is low. Our Safari Gurus have travelled across the width and breadth of Africa so that they can help plan your trip with knowledge and expertise. There is no extra charge for our services. The hotels and camps we book offer us a commission that we use to run our business. So do yourself a favour, and get in touch with us now. How is an African Safari different from other holidays? An African safari is like no other holiday. We will take you to some of the remotest parts of the world which are often untraversable for most of the year. You will be surrounded by sights and sounds — traffic of another kind — the thundering footsteps of the wildebeest migration. You will stay close to nature, almost always within the boundaries of the national parks, sometimes in lodges and sometimes in tented camps. While some of our guests love that there is nothing but a canvas sheet between them and the wilderness beyond, some of our guests prefer the safety of an enclosed lodge. Since we customise all our journeys, everything is possible! African safaris can be glamorous and they can be rustic. They can have all the amenities you would want, for example, a swimming pool, air-conditioners, wifi, hair dryers, etc, or none! We have had guests in Botswana who have camped out on mobile safaris, a caravan of their belongings following them as they cooked and bathed under the open skies. The same guests have stayed at some of the most luxurious camps in Tanzania, as they celebrated their honeymoon with Dom Pérignon. Each has its own magic. The real difference between an African safari and any other holiday is that you are truly surrounded by wilderness. You can’t drive to a nearby town for a meal. You can’t go for a stroll to a nearby market. There is usually no electricity, no mobile network, no wifi. You are completely disconnected from the world outside. Your camp, therefore, becomes your home for the duration of the trip, and the staff your family. All your meals and activities are included. And everyone goes out of their way to make your trip as comfortable and memorable as possible. Africa is a huge continent with a diverse climactic range. Most countries in southern and eastern Africa are bright and sunny for the majority of the year. Some countries have distinct dry seasons and distinct rainy seasons (also known as the green season), while some countries, especially those near the equator can be wet and humid throughout the year. Temperatures can be extremely high in desert areas (the Sahara and the Kalahari) and can be tropical along the coast (Zanzibar, Mozambique, Madagascar). Generally speaking, an African safari is best during the dry season when the animals congregate around depleting water sources. The foliage is also less dense during the dry season which makes it easier to spot wildlife. The green season can be better for viewing birds, especially migrants, and has lower rates than the dry season. However, several camps shut down during the green season due to flooding. Kenya & Tanzania: Kenya and Tanzania are wonderful safari destinations for the majority of the year. Travel during April-May (the rainy season) can be avoided. 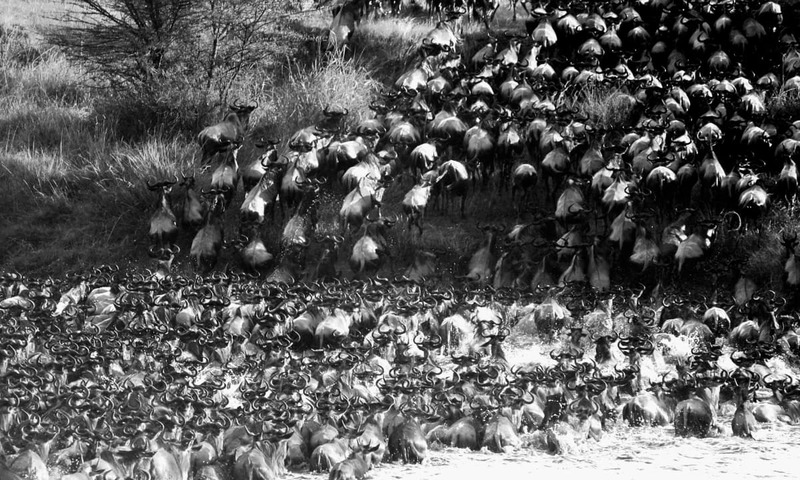 The Great Migration is a highlight for many travellers (best from July – October if you want to catch the Mara river crossings, but also great in February-March for the calving season). Mt Kilimanjaro climbs can be avoided during the rainy season (April, May, November). Uganda, Rwanda, DRC: If you’re planning a gorilla trek, it is best to avoid the rainy season (April-May, November). However, since you will be trekking across equatorial rainforests, you can expect it to rain any time of the year. Lots of slipping and sliding! Republic of Congo: Odzala National Park is situated in the heart of equatorial Africa. While you can visit at any time of the year, it is best to avoid the long rainy season from May to December. Ethiopia: The dry months from September to April are best to visit Ethiopia. It can get quite chilly in the Bale Mountains at any time of the year. Timkat, the Christian celebration of Epiphany, takes place in January and is a mesmerising sight to see. Botswana: The dry months from July to October are wonderful to see Botswana’s spectacular wildlife. June is shoulder season; rates are lower but the flooded waters of the Okavango Delta are not at their highest. South Africa: Wildlife viewing in South Africa is best during the dry winter months (May – October). If you’re looking to relax at the beach, the summer months from November to March are best. The whale watching season is from June to October every year. Zambia: Zambia is best during the dry season (May – October) with wildlife viewing becoming progressively better as the land dries out. However, from September onwards it can get rather hot and humid as the rains approach. Several camps shut down during the green season as roads become impassable. Zimbabwe: The dry winter months from May to October are the best time to visit Zimbabwe for wildlife viewing. Victoria Falls: The best time to visit Victoria Falls is directly after the rainy season, from February to May, when the Zambezi is in full flow. The mist from the falls, however, makes it not the best time for photography. From October onwards, the water levels are quite low and some parts of the falls dry up entirely. Namibia: The best time to visit Namibia is from May to October for game viewing in Etosha National Park. Temperatures can rise and drop suddenly, especially in the desert. Gabon is best during the dry months (June to October) which also coincides with the arrival of the humpback whales in Loango. Mandrill and gorilla tracking is best during the dry season. Chad: The best time to visit Zakouma National Park in Chad is March and April when the animals congregate around limited water sources. It can, however, get searingly hot during this time. A day on safari begins at dawn when the first rays of the sun hit the dew outside your tent. You will be greeted by the camp staff, a boisterous “Good Morning!” or “Hello,” as they leave a cup of coffee or tea (or hot chocolate) outside your tent. You will rise out of bed, freshen up, pour yourself a drink and be surprised by the freshly baked cookies that lie near the saucer. You will then head to the meeting area and board your safari vehicle. At Chalo Africa, we exclusively use modified 4×4 Landcruisers for our safaris. No minivans for our guests. Your guide will greet you and then you will head out into the park, the cold air revitalizing you. Remember to carry something warm becomes mornings in Africa can be chilly, especially in open vehicles. Your morning game drive will usually be for 4 hours, and after spotting lions and leopards and hopefully a pangolin or two (wishful thinking!) you will head back to camp for breakfast. Be prepared for a regal affair: eggs and freshly baked bread and muffins and bacon and sausages. In case you have dietary restrictions, your chefs will go out of their way to prepare some special for you. Just let them know in advance! After breakfast is a time of relaxation. With the sun high up in the sky, most animals consider this a perfect time for siesta. You can bathe and read and relax in the lounge area of the camp. Some camps can organise nature walks for you or a cultural visit to a nearby village at this time. Lunch is usually a light affair in camp. Salads and quiches are popular, as are casseroles and sandwiches. Don’t be worried because soon after lunch at around 3.30 pm, it will be tea time, which is usually a grand affair! Most camps have excellent chefs who love to bake decadent cakes. What is tea without cake? Take a slice and watch the slow rhythms of life of the bush. It is now time for your evening game drive. As the day cools, wildlife becomes more active. You will hear the shriek of a baboon or the cough of a bushbuck: a predator is prowling its way through the bush. Your guide sees and hears things you cannot imagine. He will take you closer, waiting around the bend, for that lonesome leopard to appear. You take in the beauty, the inspiration. You watch as it watches you, wary but fearless. It walks away and takes your breath with it. When you think your day can’t get better, your guide takes you into an unassuming spot, the sun’s rays sliding between clouds and the horizon. You wonder what is he doing. It’s getting late; shouldn’t we be heading back now? He pauses, switches off the engine, and gets out, stretching his body. The silence engulfs you. You walk a few meters away from the vehicle and are overawed by the sight of scarlet skies deepening above you. You turn around and there it is: a bar neatly arranged on the bonnet of the vehicle. Sundowners! Welcome to Africa! You head back to camp, warm with stories of the day and Amarula. In the darkness, your camp is nothing but flickers of light. A welcoming smile greets you as you descend from your vehicle. A cool towel wipes away the dust from your brow. You hear laughs, other guests encircle a campfire and share stories. You join them. Dinner is usually a boisterous affair. You will sit around a long table and eat a sumptuous three or four-course meal, marvelling at how the camp chefs manage to produce such delicious food in the middle of nowhere! After your meal, you will realise how sleepy you are. You glance at your watch and notice that its only 8 pm! What a wonderful day on safari it has been! Africa has a diverse variety of accommodation types each suited for a different type of traveller. At Chalo Africa, we are happy to customise your trip to your exact requirements. If you want to sleep under the stars, we can make it happen. If you want to have majestic views of Mt Kilimanjaro, we will try to make it happen (clouds do get in the way sometimes!) If you need a hairdryer, so be it! We use a variety of camps and lodges that subscribe to our values of being sensitive to the environment they inhabit. You can choose from the following accommodation types on your African safari. Tented camps – The original safari camp. A spacious canvas room with everything you need but nothing more. You’ll have a bed and mattress and an attached washroom with either a bucket shower or a running shower. A wardrobe for your belongings and a deck to enjoy the vistas of Africa. Your meals here are delicious, reminiscent of home. Luxury tented camps – Say hello to glamping. Large tents which can rival the poshest hotel rooms in the world. With magnificent views of your surroundings, your tents will be a home that you wished was your real home. Plush beds with the finest linens, Swarovski binoculars, copper bathtubs and much more. Meals are an activity of their own, created by expert chefs using the finest ingredients available in the region. If you want to be treated like royalty, stay in our luxury tented camps. Our luxury lodges, including some Relaix and Chateaux properties, also fall in the same league. Budget camps – For those who wish to hear the call of the wild in an affordable way, budget camping is for you. Your safaris will be serviced throughout with excellent guides throughout and trained chefs preparing your meals. The only compromise will be your accommodation: staying in spacious dome tents with mattresses on the ground. With wilderness all around you, we consider this an upgrade! Mobile safari camps – Similar to budget camping in terms of your accommodation, but different in every other way! In this option, you will have your own caravan consisting of a guide, a chef, and other staff, who will travel with you to different parks. As you head out on game drives to different regions, your team will set up camp for you under the open skies and have freshly cooked meals prepared for you by the time your back. Perfect for an affordable Botswana safari. Boutique lodges and hotels – When in a city, we believe it is best to stay like a local in these secret boutique lodges and hotels. Away from the heart of tourist zones but close enough to get the feel of the city. Discover secret cafes and pubs, eat like a local, enjoy yourself thoroughly. Beach resorts – Whether you want to laze on white sands or dive with whale sharks, a beach resort is an ideal way to relax after a safari. Check out our collection of beach resorts across the African continent. Private villas – A private villa is perfect for families or large groups on safari. Perfect for those who want to be lost in the bush but with some privacy. With your own guide and vehicle, you will have the flexibility to plan your own schedule and have a team of chefs and butlers to meet your minutest needs. Also, check out these private islands of Africa. The Offbeat – From staying in treehouses when on an African safari or staying on a houseboat, we love it all! African safaris are not inexpensive. They are generally more expensive upfront compared to other destinations. But remember, you are paying for an all-inclusive cost in most cases — from the moment you land in Africa till the moment you take off, everything is included from meals, beverages, park fees, safari activities, guiding fees, vehicle and transfer costs, and internal flights. Our Safari Gurus can help customise an itinerary that meets your budget and exceeds your expectations. We generally make use of special offers to maximise the value of your trip. How can I pay for an African Safari? We accept payments by online transfers, wire transfers, and credit cards (Visa, MasterCard, American Express). Please note that African safaris usually require full payment 90 days prior to departure. To secure your trip, we recommend purchasing travel insurance that covers trip cancellation and trip curtailment. Will I survive without WiFi or mobile phone connectivity? Yes, you will! Several camps nowadays have access to WiFi or mobile phone networks. If you’re travelling to the more remote parts of Africa, your lodge managers will have internet or mobile phone access for emergency purposes. Will I survive without electricity? Yes, you will! Most camps run generators for a few hours every day so that you can charge your phones and cameras. In case you NEED to use a hair-dryer every day, it is best to stay in a lodge with running electricity.